The tram is a important method of transportation in Prague city center. It is really easy to use because it's at street level so you do not need to walk down stairs like the metro (the Prague metro is really deep underground because during the cold war they were supposed to double as nuclear war shelters). Trams can get through the city really fast because they have right-of-way of both pedestrians and cars. And they are frequent, you never have to stand at a stop for very long, a tram comes along every few minutes. Locals use the tram all the time. Instead of walking a few blocks you simply hop into a tram, ride the few blocks and hop out. Most people have monthly passes so it is convenient. Unfortunately they are not that great for tourists. The problem is that figuring out what tram goes where is like trying to comb Medusa's hair. Trams twist and turn through Prague streets with no apparent rhyme or reason. Trams are great for locals because locals have years to figure out which tram goes where. But since trams are such a convenient way to travel you should at least try and go for a ride. Here is some basic advice. Each tram is identified by a single number. On the side of the tram is written all the stops the tram makes. But that will tell you nothing, especially since you only have 30 seconds before the tram leaves again. And in most cases the names usually have nothing to do with where they are going - you will not find station names like Charles Bridge. Using the tram map you should be able to hop your way from to tram to tram and get to almost anywhere in the city. Daytime trams run from 4:30 a.m. till midnight in 8 - 10 minute intervals (8 - 15 minutes on weekends). Night trams run from 00:30 a.m. till 4:30 a.m. in 40 minute intervals. 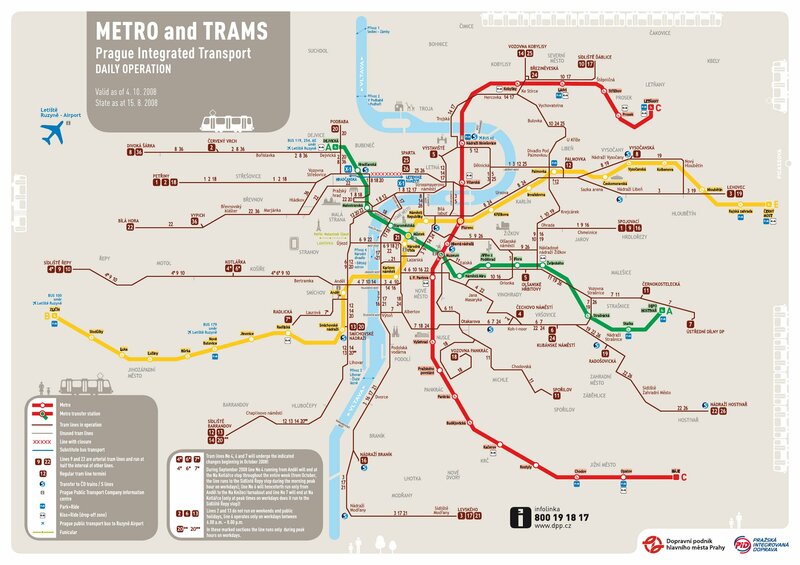 Download the tram map here: http://www.czech-transport.com/images/metro+tram-lines-day.jpg.